It is estimated American waste 150,000 tons of food every day, with an added toll to the environment in the form of land use, pesticides and water. Rotting food also clogs up landfills and releases methane, contributing to climate change. Bread: Storing bread in the fridge dehydrates it and makes it stale sooner. Storing it at room temperature is preferable. Freezing it and microwaving slices (usually 20 seconds does the trick) as needed may be your best bet. Meat: Keep your meats uncut and wrapped until they’re ready to cook. It keeps them fresher. Berries: Piled up, blueberries, raspberries and blackberries leak their juices onto one another causing them to turn mushy. Store your berries in a single layer and they’ll last longer. Tomatoes: Turn your tomatoes stem or scar down and keep them at room temperature. It prevents air and moisture from overripening them – or, at least, slows the process down. Potatoes: Store your tubers with an apple. Apples release ethylene gas and keeps potatoes from sprouting too quickly. Bananas: These also release ethylene gas – particularly from the stem, which causes them to turn brown. Wrap the stems with plastic wrap and they’ll ripen more slowly. Herbs: Freeze them in water in ice cube trays. It halts enzyme and microorganism activity. Pop out herb ice cubes as you need them, let them thaw and enjoy virtually fresh herbs anytime. Avoid washing: Don’t wash your produce before it goes into the fridge. The water can promote mould growth. To the front: Keep items you use most near the front of the refrigerator. It reduces the amount of cold air lost when the door is left open. 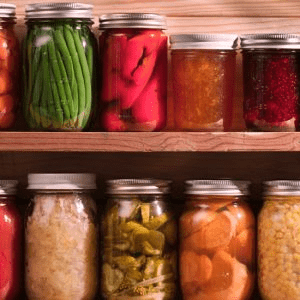 What are your foolproof ways to preserve food? Share them with your Shop Talk blog community forum members! Earth Spotlight: What are you doing on World Cleanup Day? Want to learn a new language? Si! Oui! Da! My family and myself keep all leftover vegetables and meats that have already been cooked. Save it in separate bags and freeze it. When we are looking for something hearty we take and make soups and Golouce and dips with all different ingredients. You wouldn’t beleive the flavorful soups we get.. We even make Casseroles! It’s the greatest meal and a lot cheaper than eating out these days. Also.. I save coffee grounds and use it to grow herbs and spices. Also use it in the Garden..you can really grow some great products from Coffee grounds. Another one tomatoes from the garden or bought in store chop into diced and chunks and freeze them ..they never go bad sitting around. There are lots of ways that you can keep from just throwing out perfectly good food. I’m still learning new ways! And that is my contribution to the earth and my pocketbook! This was very helpful thank you and I’m looking forward to receiving my Free samples.